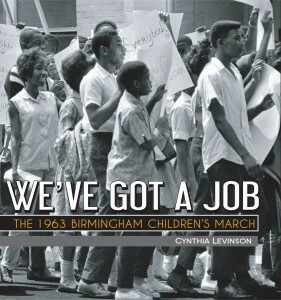 We've Got a Job: The 1963 Birmingham Children's March by Cynthia Levinson, read by Ervin Ross. Grades 6 and up. Listening Library, 2012 (book copyright Peachtree Press, 2012). 6 hours and 22 minutes. Review copy purchased. Hey, I'm an Audible affiliate, so if you purchase audiobooks after clicking on links in this post, I get a small commission. In 1963, the people leading the Civil Rights movement were desperately trying to make headway in Birmingham, Alabama - sometimes called "Bombingham" because of the high amount of bombings connected to the Civil Rights struggle. When leaders of the movement got the idea to demonstrate and protest with the goal of filling up the jails to make a media splash, it seemed like a good idea. But the stakes were too high for many adult protesters... So the children and teens decided to go to jail. Yes, this is a book about the Birmingham Children's March of 1963, but it's also a really rich resource on civil rights in general. There were many civil rights demonstrations that led up to the Children's March - sit-ins at lunch counters, ride-ins on segregated buses, marches and parades by adults - none of which really had the desired effect. This is an important book, not only for telling a little-known story, but for telling a story about kids and teens making a difference. The story of the Birmingham Children's March clearly illustrates that kids can make a difference and sometimes their efforts are essential. Ervin Ross's narration is steady and clear and it fits the content nicely. This past year I've gotten into NPR and I'm enjoying listening to nonfiction audiobooks all the more (they're like long NPR episodes! You learn so much!). A very nice feature of the audiobook is that parts of Cynthia Levinson's recorded interviews with the featured activists are included. It was great to hear them talking about their experiences in their own words after reading about them in the book. Often, listening to youth nonfiction books on audio is a little bit of a trade-off because there are photos, diagrams, or illustrations that you're missing. We've Got a Job is no exception, so you may want to hunt down a print copy to see photos of the four featured activists and other events mentioned in the book. I will say that, having listened to the audiobook first and then picked up the print book, there were less photos than I had thought there would be. There's a great deal of uninterrupted text, which may scare off some young readers. This book is rich with content that would fit Common Core standards. It has much to add to units on Civil Rights and American history. Don't miss it! We've Got a Job is on shelves now!